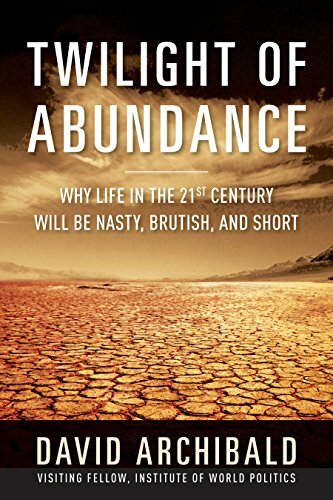 [PDF] Twilight of Abundance: Why Life in the 21st Century Will Be Nasty, Brutish, and Short | Free eBooks Download - EBOOKEE! Description: Baby boomers enjoyed the most benign period in human history: fifty years of relative peace, cheap energy, plentiful grain supply, and a warming climate due to the highest solar activity for 8,000 years. The party is overâ€”prepare for the twilight of abundance. 2018-01-06[PDF] Kevin McCloud's 43 Principles of Home: Enjoying Life in the 21st Century. 2016-12-22[PDF] Kevin McCloud's 43 Principles of Home: Enjoying Life in the 21st Century. No comments for "[PDF] Twilight of Abundance: Why Life in the 21st Century Will Be Nasty, Brutish, and Short".